In The Web 2.0 Adoption Curve, I asserted that executives had a career-defining opportunity to leapfrog competitors by using risk management to manage through the Web 2.0 adoption cycle. The cycle will also feature a backlash against—and investment gap in—Web 2.0 beginning next year. Here I will discuss in more detail how to avoid the downdraft and outperform competitors over the next several years. Web 2.0 will transform organization and society because it changes how people discover, build and maintain relationships. All organizations need to understand these dynamics, so they can become stronger and more relevant. 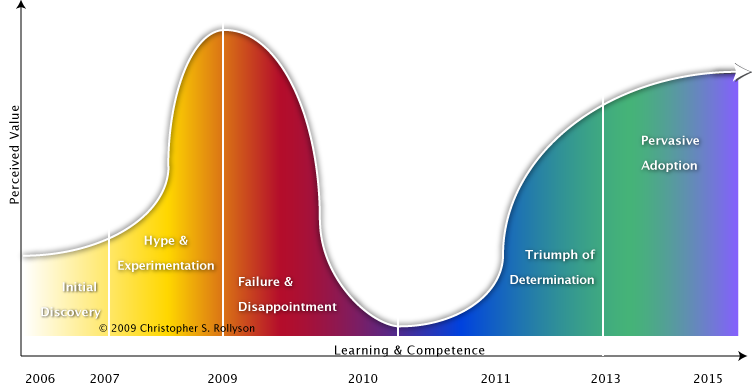 The Web 2.0 Adoption Curve [click to enlarge] tells us that disruptive technology follows a predictable pattern. Because the technology is disruptive, people must change some aspect(s) of their assumptions, ways of working, etc. Since the technology is new, initial excitement is based on an incomplete understanding of how to apply it to business, a proposition that means mashing up old and new at several levels simultaneously. 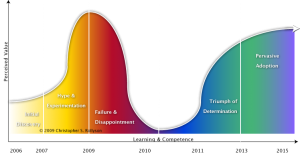 The shape of the Web 2.0 Adoption Curve is a function of perceived value (vertical) and competence (horizontal). Since perceived value is currently high but competence is low, I am predicting disenchantment with Web 2.0 around 2010 that will lead to a gap of investment. Web 1.0’s tech bust led to such a gap, and there are myriad other examples. This gap can be a significant competitive advantage to those who manage their risk and plan to invest throughout the period. Here’s how to do it. Web 2.0 is significantly different from Web 1.0 (the Internet) because it is largely about people using software as a service resources for social interaction. Social activity and behavior is the focus, not information exchange and digital commercial transactions as in Web 1.0. Web 2.0 enables people to digitize aspects of social behavior, thereby driving down the cost of social interaction. It’s a far more complex proposition that requires more social savvy than Web 1.0’s programming and systems integration. Your organization should focus on developing the competencies to carry out (eventually) extensive Web 2.0 interaction. Web 2.0 will transform your business processes (and everyone else’s) because it changes how people make buying decisions. Rapid cycles—use Web 2.0’s asynchronous, digital processes to provide short feedback loops between various parties, similar to TQM or short-cycle software development. You will be able to correct faster and waste less. Transparency and inclusion—it is a truism that Web 2.0 tends to be “boundaryless,” as do networks in general. Participants in your Web 2.0 initiatives will take you in directions you had not planned on, and that is often a good thing. However, minimize setbacks by involving diverse stakeholders in the beginning: legal, public relations, revenue owners and accounting/finance, for example. Get appropriate outside counsel that can explain how to address concerns. Get a balanced team: the controllers, operators and the P&L owners. Stakeholder focus—your external stakeholders have their own adoption rhythms, but you can bet that they will increasingly expect you to be able to communicate with them in the ways they want (and these are changing fast). They probably include customers/clients, investors, employees, regulators, partners, media, analysts, the public. Understand how they are using the Web 2.0 ecosystem. Develop explicit models for their worksteams, which drive how they use the ecosystem. Don’t overlook internal stakeholders and how they affect your business. They can include business units with which you have dependencies, alliance partners and appropriate champion(s). Budgeting/ROI—chunk initiatives small, and insist on measures that include quantitative indications of engagement. In most cases, do not pursue grand ventures: you will spend too much time in the ROI discussion while more agile orgs will engage your stakeholders instead. Assess—don’t assume you need to “do” Web 2.0 right away. Begin by matching goals with organization and stakeholder realities. The Web 2.0 Ecosystem Audit and Web 2.0 Readiness Assessment help with this. Pilot—pursue small pilots with verifiable measures; learn and iterate in short cycles. Scale—use pilots to test different risk areas. When done well, these will morph into stable processes that you can scale, especially since this is the intent and you have mitigated major risk areas. Integrate—As you scale Web 2.0 processes, you will want to revisit your legacy processes and “rebalance” with Web 2.0 (replace old with new). This will be analogous to e-business and e-commerce, which were pursued as standalone efforts at first but were integrated later. Organizations can change the shape of their adoption curves as shown right [click to enlarge] by using this risk management approach. By pursuing smaller investments with rapid cycles, they have curves with smaller amplitudes. They are less affected by market hype during 2009-2010, and their investments—and learning—are more constant than the market during 2010-2011. Keeping in mind that Web 2.0 is a transformation opportunity, investing more in strategic business processes will define tomorrow’s market leaders. This period is akin to 19th century industrialization in which people like Thomas Edison and Andrew Carnegie understood, acted and grew dominant. Web 2.0 will drive a fundamental reorganization of society, geography, business and government. Leaders who understand this disruption and act on it will have tremendous opportunity. Many others will learn too late and lose competitive position. Organizations need to learn how to collaborate in networked Web 2.0 style—as quickly as possible. There is an art and science to applying disruption to mature organizations, and I’ve outlined some of the principles here. Although disruptions change, human beings’ behavior when adopting disruption is broadly predictable. People need time to understand disruption and go through a period of experimentation before they reach a new synthesis. What do you predict for the adoption cycle during 2009-2010? How are you planning on managing your Web 2.0 investments? BTW, the Web 2.0 Adoption Curve is the latest tool of the Social Network Roadmap, an approach for rapidly adopting social networks by mitigating risk.